The Interpublic Group of Companies, Inc.’s IPG subsidiary – Weber Shandwick – completed the acquisition of Cappuccino on May 15. Based in Sao Paulo, Brazil, Cappuccino is a digital marketing and technology agency. The financial terms of the deal have been kept under wraps. The deal, effective immediately, will see integration of Weber Shandwick's public relations and integrated marketing capabilities with Cappuccino's specialization in digital content, technology production and strategic planning. It is expected to boost Weber Shandwick’s creativity and digital strategy. Cappuccino offers an extensive range of digital offerings in the form of content creation, social media, mobile, paid distribution, SEO and design and development. Further, Cappuccino has already conducted digital campaigns for several top local and multinational organizations in Brazil, with clients like Ajinomoto, Arcor, Boeringher Ingelheim and Citi. With broader exposure to the Brazilian market, the buyout of Cappuccino should help Weber Shandwick strengthen its foothold across Latin America. Of late, Weber Shandwick has been busy in expanding its operations in Latin America to meet the growing demand from domestic and multinational companies in the region. It already has owned and operated offices in Brazil, Colombia and Mexico and affiliates in Argentina, Chile and Peru. In March 2018, it opened a new office in Bogota, Colombia. Based on the strong demand for its digital and marketing services, Weber Shandwick's parent organization – Interpublic is focused on strengthening its position with new business activities as well as opportunities from existing and new clients. Moreover, it continues to look for strategic investments/acquisitions to expand in high-growth regions and key world markets. A digital marketing agency based in the United States and an independent media agency and digital consultancy based in Finland were acquired in 2017. In 2016, a content creation and digital agency with offices in the United States and United Kingdom., a public relations and digital agency based in China and a U.K. based mobile focused digital agency were acquired. We believe the buyout of Cappuccino by its subsidiary is one of Interpublic’s several strategic business opportunities to boost its digital capabilities.Interpublic’s digital capabilities, diversified business model and geographic reach offer a distinctive competitive advantage. The company is expected to achieve targeted levels in the coming quarters based on diversification across emerging regions and collaboration/integration across agencies through technological improvement. 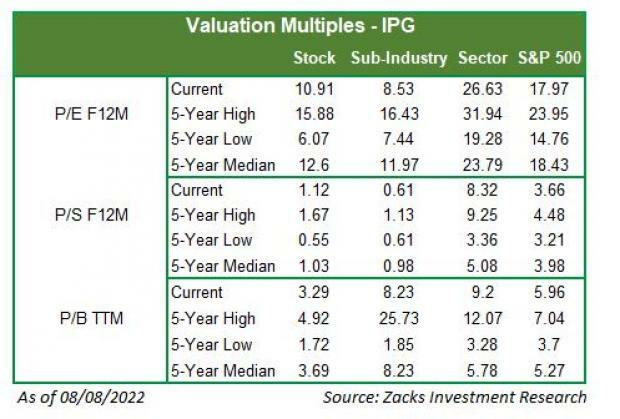 Currently, Interpublic is a Zacks Rank #2 (Buy) stock. You can see the complete list of today’s Zacks #1 Rank (Strong Buy) stocks here. A glimpse of the company’s price trend reveals that the stock has had an impressive run on the bourse in the last six months. Shares of Interpublic havereturned 27.2%, outperforming the industry’s gain of 6.2%. Some other top-ranked stocks in the broader Business Services sector include Automatic Data Processing ADP, Mastercard Inc. MA andBroadridge Financial Solutions Inc. BR. While Mastercard sports a Zacks Rank #1, Automatic Data Processing and Broadridge carry a Zacks Rank #2. The long-term expected earnings per share growth rates for Automatic Data Processing, Mastercard and Broadridge are 11%, 19.03% and 10%, respectively.